After two minutes the firing stopped, and a small group of us girls fled the mosque bare-footed, running to Bayat building, the nearest building. We looked for a place to hide, but there was none. Then we heard shots from the second floor, and some girls began to shriek. The sounds of gunfire came from everywhere. We were trapped. I ran to the exit of the building, but before I could reach it, there was more shooting. This time I flattened myself to the ground and covered my ears tight, trying to prevent the sounds of violence from reaching my mind. After 30 seconds I looked behind me. All the girls I’d been with were wounded. Then I saw a man holding a gun walking on the other side of the hall. “Alia. Now it is finished,” I told myself. “There is no way to escape.” I lay flat, listening for a long time to the horrifying sounds of the gunman firing at the students. The hall was in complete darkness. I tried to calm myself so that I would not shake. I could hear each step the man took. He was uniformed just like the university’s guards, but he was firing at students. It was a confusing sight. For several hours I stayed in the same place. The Taliban had the keys for each room of the building. They opened one room after another and took students upstairs. They must have thought I was dead. I was very hopeful. I kept hoping the police would come save me, but after three hours I gave up and started to think about my last dreams. The nearer the bullets got to me, the more debris from the floor was hitting my legs. I suddenly couldn’t keep my legs still; I moved them, and the firing stopped. I heard laughter and knew they must have seen me; they would shoot me now. I said my last words and prepared to die. I waited and waited, but they did nothing. They did not shoot me. At 1:30 a.m., I decided I would surrender. I would shout that I was alive. The Taliban was upstairs so I waited for them to return. Then the door in front of me opened and four men entered the hall. They were whispering. I thought they were Taliban, so I said I was alive and wanted to surrender. They said, “Be quiet, we are police.” They took me out of the building. My feet hurt to walk. I felt shards of glass in them. I was taken to the nearest hospital. I was saved. I still feel some kind of fear inside. The Taliban attacked the most prestigious university in Afghanistan, showing their opposition to education. But I know we students must find our bravery, stand beside AUAF, and tell the Taliban that AUAF is alive and will prevail, becoming even stronger. This story has been published as part of our partnership with Women’s eNews Teen Voices series. Photo by US Embassy Kabul. Alia, it saddens me to learn about the tribulations that you and others deal with in Afghanistan. I’m inspired by your story to continue to strive for a college degree and be the first in my family to graduate from college. One question that I have for you is how has this situation affected your life, like how does it make you feel when you think about it ? And how has the war in Afghanistan affected you ? Has anyone that you know lost their lives because of the taliban? Great story, it helps us realize what some have and don’t. It’s scary how things are out there but people think its nothing or don’t take us serious. I similarly lived the way you lived, running away and hidding, but now that i’m stable I feel great and I’m glad you are okay and or better now. Keep it up and show us that your people can make a change for our future. Thank you so much for writing about this horrific experience so that we can know about the terrorism that you faced and what Afghan people continue to face every day. You are so brave to write about this and I applaud your courage and determination to return to AUAF and continue. You will be in my thoughts and heart. I can’t begin to imagine the courage this awful attack demanded at your young age. I am so glad you were able to write about the experience and share it with us. I pray for your healing, safety and your continued education. Peace! Nobody should ever, ever have to suffer in the terrible ways you have suffered. What you have experienced is beyond appalling. I marvel at the courage and strength you have, to write so honestly about something utterly unbearable. I thank you and join my heart to yours, and all who suffer the same around you. I want you to know that your words reach us even here in faraway New Zealand and although we feel grief-stricken and helpless to assist you, we feel for you and with you. The voices of women are what is missing and what is needed to change the balance in this awful world – thank you for writing the truth we all need to know. Your honesty will heal the world, one day – may it be soon. What can be done to penetrate the hearts of these brutes? It breaks my own heart to read this. Thank Heaven you are well and survived to write about it. The tragedy that Alia experienced is both an inspiration and insight about the extreme crimes the Taliban will commit to spread their beliefs. The massacre that took place on August 24, 2016 showed me the importance of never losing hope. During the conflict, Alia faced several near-death situations, but was motivated by her faith to keep fighting until help arrived. At some points Alia’s strength was tested. For example, when four boys from her class surrendered themselves to the Taliban and one was instantly executed. When this occurred Alia felt that there would be no hope for her survival and that she should surrender just like her other classmates. I am very thankful that a combination of Alia’s strong personality and a stroke of luck was enough to bring her to safety. This story has shown me to keep believing even when all hope seems to be lost. I look at my nation and the people in it and realize how blessed we are. Yet, most of us complain about everything. I have heard so many people criticizing the great school that they go to and it is hard watching because in Afghanistan, people work so hard for their education. What happened at AUAF is absolutely tragic and deserves more attention than it gets. We all need to be thankful for everything we have daily. It is astonishing to realize how none of the students knew that this was going to happen the morning they woke up. They went to school like it was just an ordinary day, but some never returned. None of us know what will happen today or tomorrow. Yet, we do know we can be grateful for the blessings and mercies we receive day by day. I know Jesus is in control of my life and He will take care of me and those who trust in Him through the hardest times. That is why I will not fear because God’s will will be done in the end. There is no way to stop what will happen, so trust in Him and stay faithful. You are in our prayers. Reading this story really made me sad because it shows what society has gotten used to. Everyday we hear about violence, natural disasters, war and many more. In the news we here about these tragedies and just brush it aside. But it really touched me to here such a personal story of the events that took place. It really makes one think about how some people have to live in fear and personally makes me more appreciative of the life that I have. Another reason that this was a powerful story to me was the fact that Alia is 16, this allowed me to relate to her better. I admire your courage and your spirit. I admire that you said the student will start beside the AUAF and prove to Taliban that you are still alive and will become stronger. That’s the bravest thing. Terrorist attacks made people suffered a lot, but we should not compromise because of fears and pains. The terrorist attacks will never stop until we become strong and start to fight. The education is really important, nobody should give up the right to be educated. I can’t image how terrible the terrorist attack was, in a college… Thank you so much for writing this article and share it, that took a lot of courage. I’m so sorry that you had to go through such a horrible tragedy. I also admit that you were also a bit lucky- lucky that you survived a horrible tragedy. This very incident is a perfect example of why education is necessary, without education,horrible tragedies will continue to occur. News of such an event as the one experienced by Alia is truly a despairing experience. Being only 16 years old shows how much more traumatizing this circumstance was and it allows me to have more easily understood the extremity of the experience. It was an overall mournful event that the Taliban sparked however this event did not stop the students from further continuing their education. The students such as Alia that live to tell this traumatic experience were able to also allow other readers like me to realize how minute the situations in our lives are in comparison to theirs. Alia, showed great strengths during this attack by the Taliban, and during times where she felt of surrendering she was able to persevere and that led her to being rescued by the police. I am glad that Alia survived to share such an experience with the rest of the world, as it gives a realistic viewpoint on what is occurring. Dear Alia, thank you for sharing your horrific experience. While I am reading this essay, I relate your experiences to movie’s scenes. For me, it is difficult to imagine the hardships you have overcame; terrorist attack seems to be unrealistic. I have never imagine this terrifying event would have happened to a girl at 16 years old. Although the terrorist attack has obstructed you from receiving education, it leads you to become a stronger person. Your experience reminds me of an idiom “Sometimes misfortune is a blessing in disguise”. This inspires me to always have faith and hope. I am proud of you for not being pessimistic and complain about the suffer you’ve encountered. I am sorry to hear about that bad news from you. Also, I really admire you after I read the article. As we know, War always brings the indelible shadows for people. Especially, Students who want to be educated should not be involved in a war. The society need educated and talented people to make better. However, they become the most vulnerable party in the war. Soldiers bully unarmed students is unfair and cruel. All the people have responsibility to work for world peace and return the bright future for children. This is a very heartfelt story about the situations that an innocent student had to go through due to the bad choices of the Taliban. It is very surprising how courageous she was even though she went through such a traumatic experience. Once someone goes through something like that, it is very hard to get over it, which goes with what she said about even after the attack she still has fear inside of her. Her positivity and cooperation with the police helped her get to the hospital and luckily survive. This article provides a first-hand experience of what happens during a terrorist attack and how it affects the individual both physically and mentally. The tragedy Alia has encountered gives me signal that there are still some places suffering from wars. Living in a peace society, wars do not seem relevant to my daily life. It is terrifying to think, that there are still people live their life under the horror of war. The article not only shows that Alia has been strong all the time (even though she sees some people being killed by Taliban), but also indicates that it is crucial to introduce peace to any place of this earth. This shows me that wars do not mean anything but to hurt innocent civilians like Alia. This is an example of a tragic event in our world today. It is unfortunate that such suffering has become a symbol of such a beautiful and peaceful religion. Can we not just have peace, end the violence, end the bloodshed. All this loss and what for, for some low life organization to try and show power. Murder of the defenseless is not power, it’s cowardly, unjust, and weak. What do you gain out of murdering innocents? Only thing the Taliban is gaining from this is hate and intolerance. Being a Muslim, I have been racially discriminated and looked down upon. While it is true you can not erase an ideal that people believe in, we can do our best in resisting it. If we do not fear it, it cannot hurt us. You have gone through something horrific that NO ONE should EVER have to experience. You are a survivor and an OVERCOMER. You have overcome insurmountable odds. You write powerfully and I pray that you are processing and allowing yourself to grief your near-death experience and to allow yourself to feel the pain – this is the only way to heal. You will become stronger for this, even though you did NOT deserve it. You are courageous and strong and I admire you and cannot believe what you have gone through. Like someone mentioned in a previous comment, what you experienced is like a scene in action movies, except, yours actually happened. I am so sorry this happened to you and so grateful that you are alive. I hope you are well and praying protection and blessings over you. May you continue to write and find healing in the process, knowing that your words are read and listened to! We are listening! Although few, we ARE listening. Take courage dear heart. You said a lot about the women of Afghanistan, we hope that this country returns to the good conditions as soon as possible. Thanks for sharing your experience. You have a way with the words, it feels as if I’m there so please keep writing. I hope one day all violence will end in the beautiful country of Afghanistan. Thank you for having the courage to share your experience with the rest of us. It is sickening to hear about the acts of violence and terror that goes on in other parts of the world but it is the reality for others like you. To live through this terrible tragedy must be a great burden but I have a belief that you will survive as your story shows just how strong you are. I pray that someday, a new world arises where you don’t need to live in fear or constantly look over your shoulder but rather we can all live in peace. Your story just makes me realize all the things I take for granted in the United States and just how lucky I am. I know that one day, the world will be a better place and that we will all be able to live together peacefully. To get to that day, however, it is stories like these that force the rest of us to look at the reality of the world and incentivize us to do something with our lives. Alia, please don’t ever stop writing as it is messages like yours that create change in the world. This is an impacting story that chills to the very bone because of the extent of the Taliban’s violence and opposition to women’s education. It is a disgusting tragedy that women must fight for their right to education, to drive, to be who they wish to be in a place that they should know as home. As a survivor, you are right to say that the girls and boys must learn and fight the oppression of women in order to show that women will prevail over their oppression. It is very sickening that the Taliban continue to haunt Afghanistan and its women, but women like Alia will rise and prevail over these horrid men and their twisted beliefs. Eventually these women will become the strong foundation of the resistance against the Taliban and fighters for women’s equality and ability to become what they wish. As someone living in the United States, it is hard to imagine the everyday fear and oppression that the Taliban must force onto the communities of Afghanistan. The acts of the Taliban cause the discrimination against Muslims, even though Islam is a peaceful religion. The acts of a rogue group that has corrupted beliefs that causes people to view Islam as the issue is a terrible example of misinformation that causes Muslims to be discriminated when it is the Taliban hurting them. Keep fighting Alia, for you are a symbol of resistance. Thank you for sharing your experience with the rest of the world you’re a very strong and brave woman able to although filled with fear stay quiet and as calm as one could be. You’re a survivor, you persevered, you overcame all the challenges that were put in front of you with your near-death experience. Mashallah you write beautifully and have a bright future I hope you continue to write sharing more of your incredible gift with the world. Afghanistan at this time is facing hardship with a lot of violence and very little peace, however I pray that there will be a time where Allah brings peace to the land and the hardships that many face including you will wash away with a new beginning. Its people like you that allow for this change that educate others, that will bring this new resurrected country. The more your write the more people will learn and began to understand healing not only yourself but also healing others and opening their eyes to the horrors that many believe are only seen in movies. Alia I admire you for your courage, strength, and bravery to not only surviving your incident, but sharing it with the rest of the world. May Allah give you blessing for you have not only educated people in the mind, but have also touched their hearts. Dear Alia, I hope you are well as of now because it must have been severely difficult to be in a situation like this. Although fear could still be there for you, resilience and perseverance are what will help everyone in the end. I feel deep pain and sorrow for all the lost students that were attacked, and I pray for no one else to have the same fate. For now, all I can say is to be strong and to pass the message of peace and faith, because there will be other people that might need this message as well. Your story shows a terrifying event that people should never have to go through at such a young age. The feeling of being trapped and having nowhere to go is horrifying and something I have never experienced. This story really shows how sometimes the unexpected can happen so suddenly. It makes me sick to my stomach knowing that innocent people are losing their lives for these pointless acts of violence and how women have to fight for their rights to education. Your story makes me feel as if I am with you in this, and gives a point of view that many people don’t get the chance to see. I commend you for your confidence, bravery, and hope. Thank you for sharing this story, and I hope you continue writing to share your view and help make a change that this world needs. I cannot imagine being in a situation so frightening, furthermore, I cannot imagine having the courage to share my story with the world. I cannot fathom the difficulty of dealing with this at such a young age. Your story makes me more grateful for the basic rights and opportunities that I am given here in the United States. I hope that one day we can all live in a world ruled by peace, and accept each other, rather than use terror and destruction to take down those who we do not agree with. I hope that you have decided to continue your education, despite your horrific experience. I wish you all the best. The tragedy experienced by Alia tells us how terrible it is when there is a terrorist attack. When she was trapped, she felt so frightened that she even wanted to surrender. It is quite hard for me to imagine to be trapped in such situation because I am living in a peaceful community. If I am facing a terrorist attack like that, I may be scared to death. When I was reading her story, I felt painful. There were so many innocent people wounded and dead in the assault. We should cherish our daily lives without violence. Thank you for sharing with us your story. Even though a place of education was attacked, that doesn’t mean that you should stop getting an education. Education is the only way women can be able to have their voices heard. In Islam, education is highly revered. While this isn’t the same situation, my grandmother in Pakistan was refused an education since she was a woman and was used to clean and do work around the home. When she was 16, she was married off to a man who was over ten years older than him. Today, she tells me that she could have carved her own path in life if she had gotten a good education. The Taliban’s interpretation of Islam is flawed since education for both men and women is equally important. During the Fatimid Era, many great Muslims poets and scholars emerged such as Rumi and Al-Khwarizmi. This was due to the extra attention given to education which is preached in Islam. The Taliban’s interpretation of Islam is used to favor themselves and not what is preached. Education for everyone in that area could possibly change the situation that Afghanistan is currently in. I truly feel sorry that you needed to go through these tragedies. I hope that today you are being properly educated and treated as an equal. Dear Alia, I appreciate that you shared your experience although it is really horrible and terrifying event for you. It is really heartbroken story about the situation that the all innocent students have got under attack from Taliban. I feel sorry for you and all Afghan women that they are having dangerous experiences. Also, it is good to hear you have rescued by police. Although it is hard to remove the trauma from your mind, I wish you will overcome it eventually. By sharing your story, I learned the fact that many Afghan women are having struggle with the terrorism and its trauma, and I wish many people read your painful story and get much interest on how much Afghan Women get pain in daily life by terrorism. 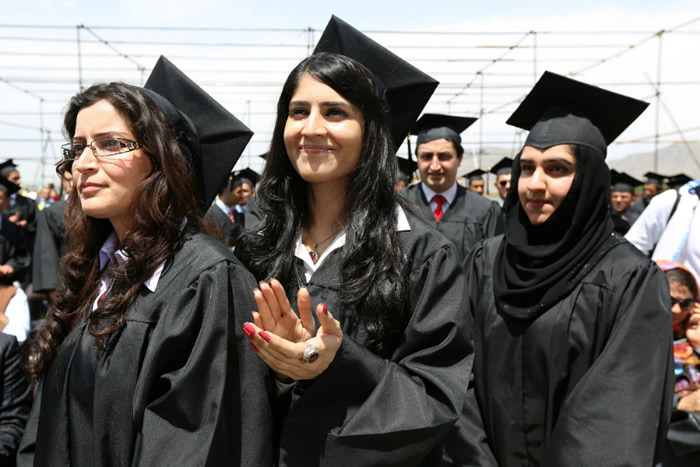 I am deeply sorry for the troubles that women in Afghanistan face daily to receive an education. This event should not have occurred nor should it be the reality of every woman living in the country. While the experience in traumatic, it is important for women to continue to act defiantly against the Taliban’s abusive ways, as they can only win if they scare the people into hiding. I hope that the views people have of women will one day change and people will learn that it is wrong to take harm people regardless of the fact they disagree with them. Originally, it is a story by Mrs. Bereshna Musazai, a classmate of mine who luckily survived the attack on AUAF, with injuries on her paralyzed leg. I think the story is just quoted by Alia, hence she is not the story’s main character. The credit goes to Mrs. Musazai. Thanks for taking the time and effort to tell us the story. I can not imagine how hard it must have been to relive and write about a memory as disastrous or scary as-as that. It must have taken a lot of courage to be able to not move or have any response as to not give you away, while so much chaos and hardship surrounded you. Personally, I don’t think I could even imagine doing what you did. These things happen on the daily over there and it must be frightening to have to live in constant fear of having another event similar to this happen. I was devastated to hear that your school was under attack. Not only is it unfair for the students, but it is crucial to have a well deserved education taken away from someone. You are so brave to be able to tell this story, and take what happened, as a way to become stronger. I never thought a story could inspire a student this much, but it did. From wanting to surrender, and giving up, you still had hope, which is so important. It made me realize how easy it is to give up on something, however it also showed me how strong we are to overcome that. Reading your essay appalled me! I was utterly devastated to learn about this attack. I just wanted to thank you for taking the time to talk about such a horrific event. To recount such a terrible memory is extremely hard to do and you have inspired me in many different ways. Keeping your nerve during the attack stood out to me; it’s not easy to stay calm in such a moment. Having the courage to surrender to them was also a powerful moment in my opinion, and I was astonished by your bravery. This is definitely an impact story for me to hear. I really appreciate you share the story to us. It is hard for us, who are living in such a peaceful place, to believe that the world somewhere is still having this kind of terrible thing. But it still happens. Afghanistan now is facing hardship. There is a lot of violence and only a little peace. I hope you are able to overcome fear and continue to receive education at the university. I believe if everyone is knowledgeable and society improves, then this kind of violence will not happen again! Thank you for telling this story to us. I had never imagined things like this happen around us. I was amazed by your courage and I am also glad that you can talk about this to others. But at the same time, I also feel bad about what you had experienced, you said gun shut is normal there, I hope those gun shut sound would never show up again. I believe your country and environment will get better. People like you had been educated which I think is one of the most important elements for a country to improve because the more educated the young generation is the better a country’s future would be like. I like your article. It is well organized and it is meaningful to read. Last but not least, this article you wrote made me be thankful for every day’s peaceful life. I am sorry that you had been through these hard conditions, and I feel sad that your school is under the Taliban attack. Thank you so much to write this story and share your experience with us, I admire your courage and bravery under the attack. This article makes me realize how lucky I am, and I can’t imagine what I going to be like if I am under these suffer. I hope that things will get better, and live in peace. I also hope that you are going to continue your education and treated equally by others.